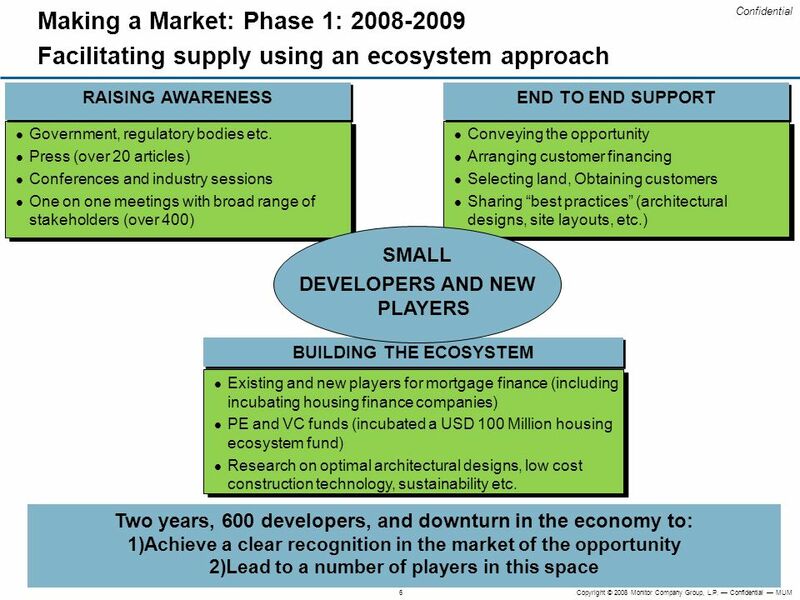 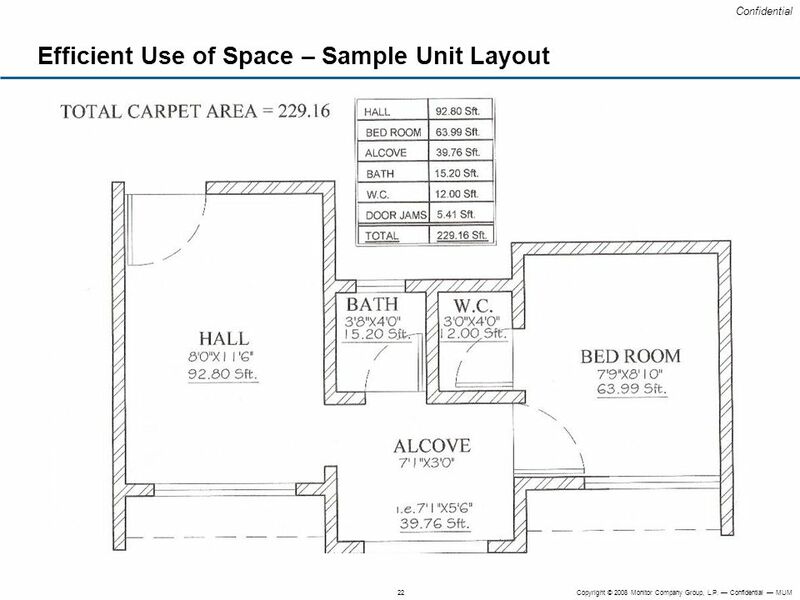 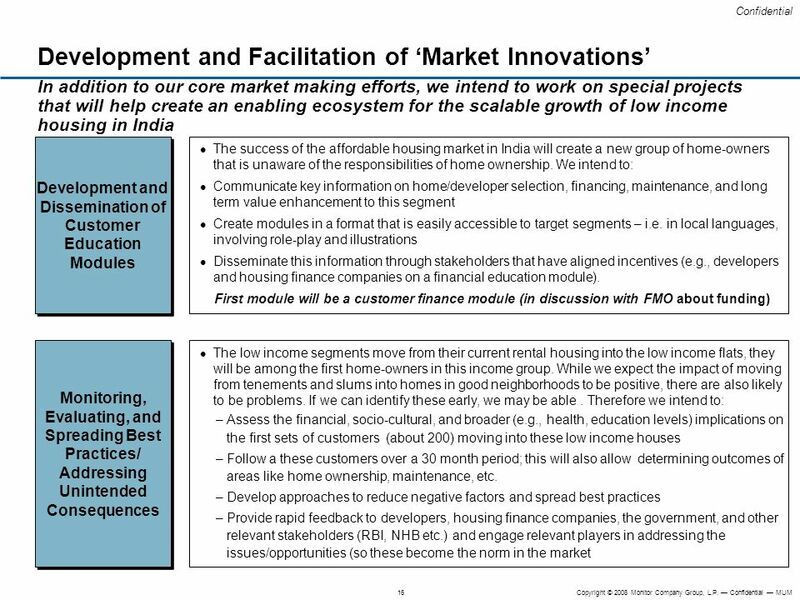 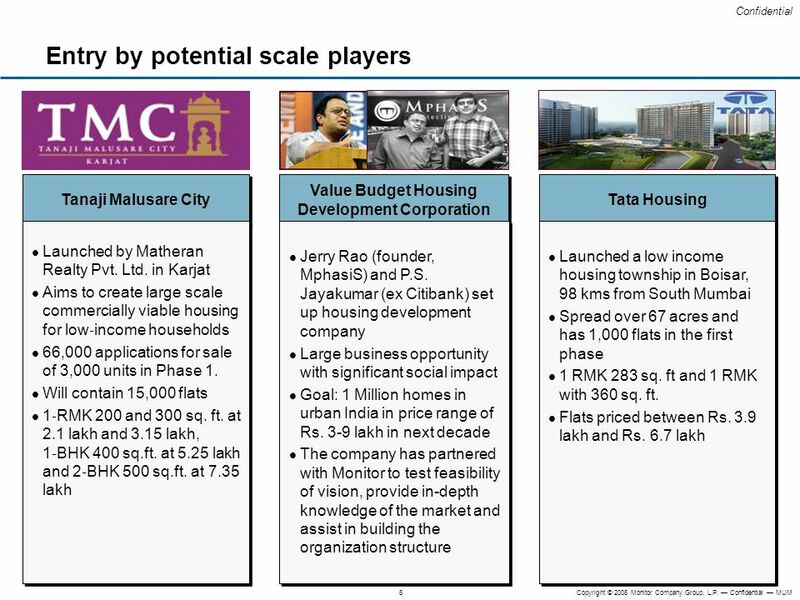 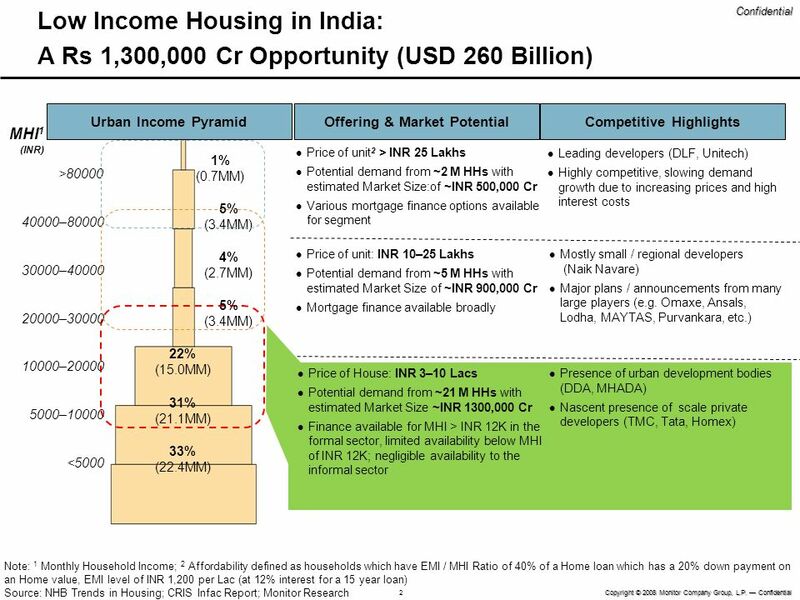 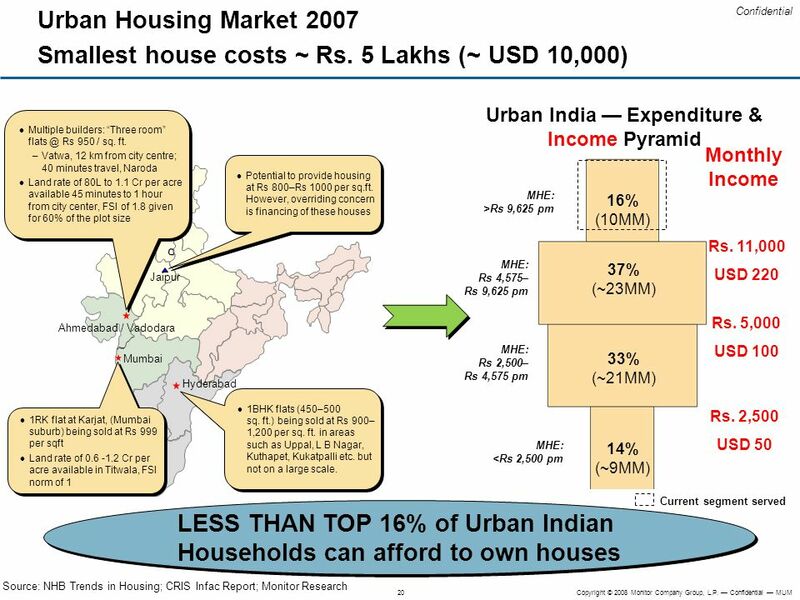 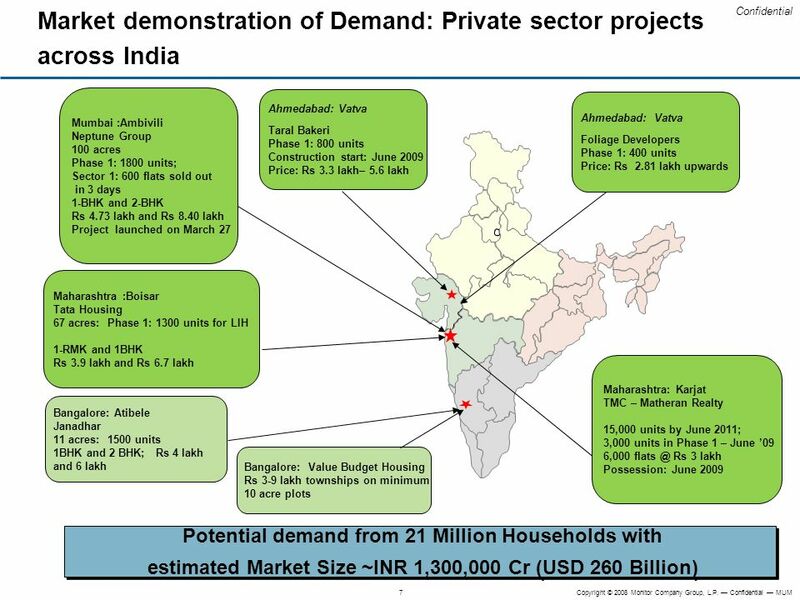 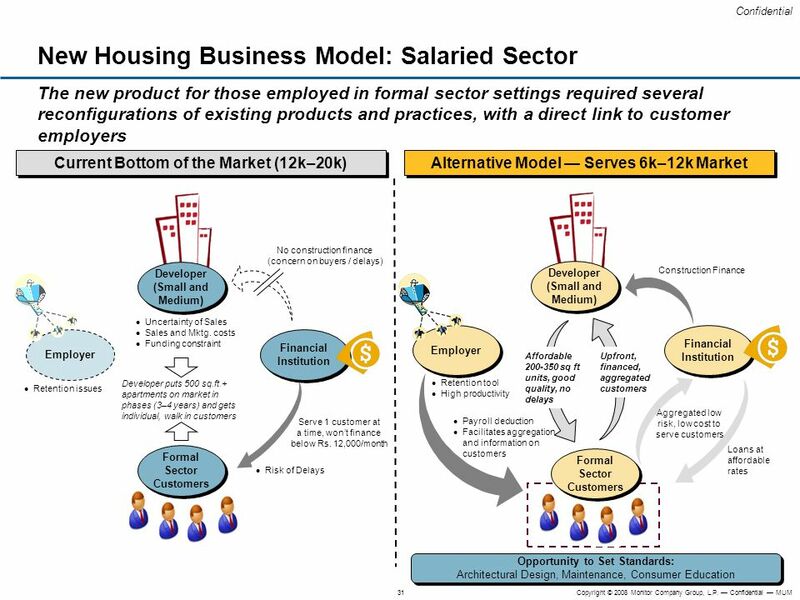 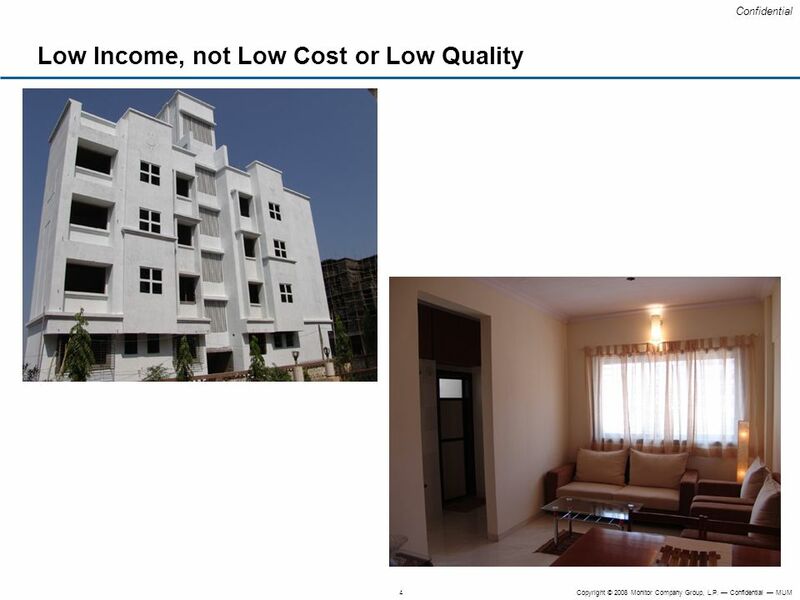 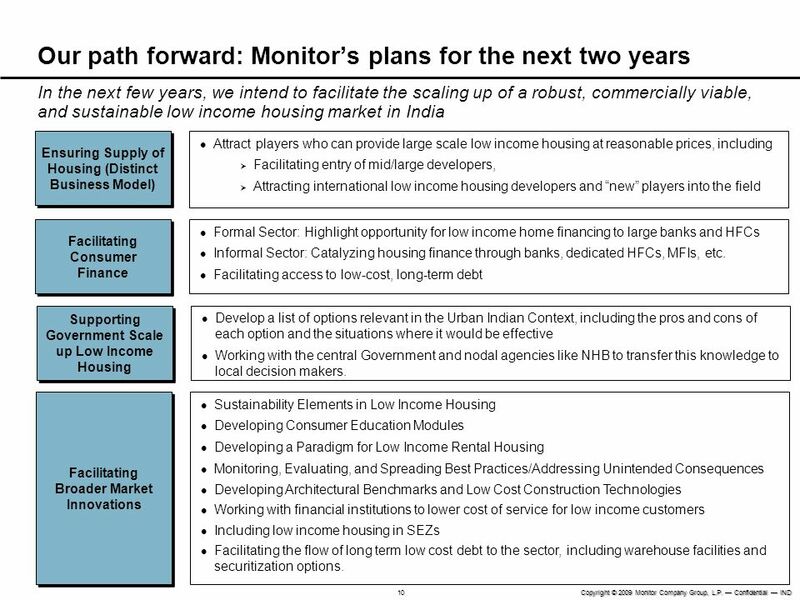 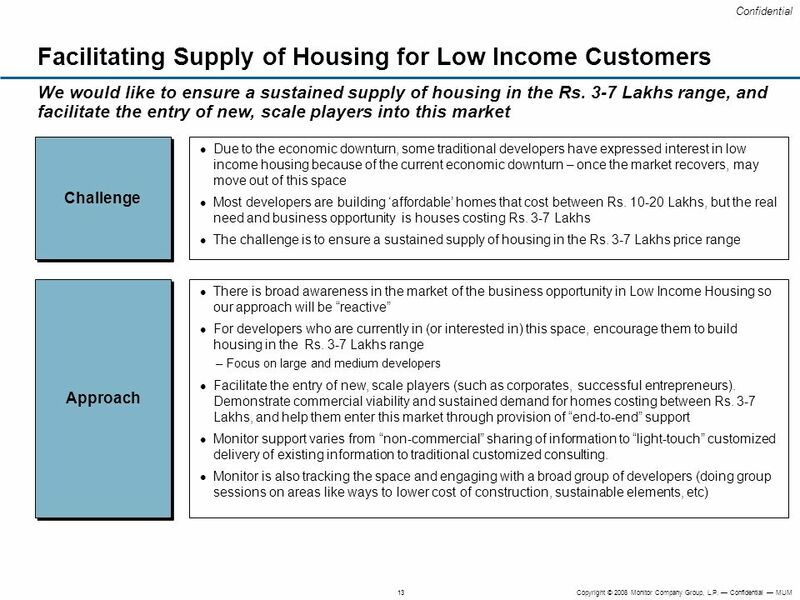 In the next few years, we intend to facilitate the scaling up of a robust, commercially viable, and sustainable low income housing market in India Ensuring Supply of Housing (Distinct Business Model) Attract players who can provide large scale low income housing at reasonable prices, including Facilitating entry of mid/large developers, Attracting international low income housing developers and “new” players into the field Facilitating Consumer Finance Formal Sector: Highlight opportunity for low income home financing to large banks and HFCs Informal Sector: Catalyzing housing finance through banks, dedicated HFCs, MFIs, etc. 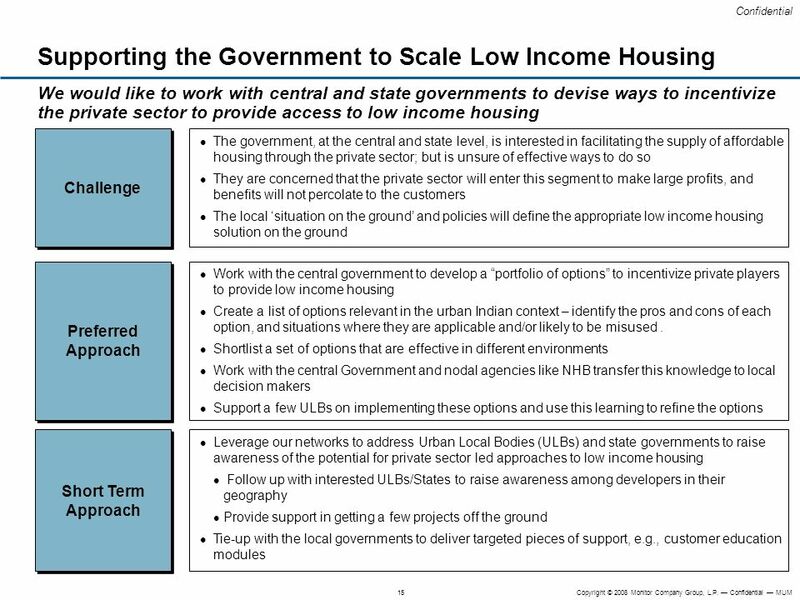 Facilitating access to low-cost, long-term debt Supporting Government Scale up Low Income Housing Develop a list of options relevant in the Urban Indian Context, including the pros and cons of each option and the situations where it would be effective Working with the central Government and nodal agencies like NHB to transfer this knowledge to local decision makers. 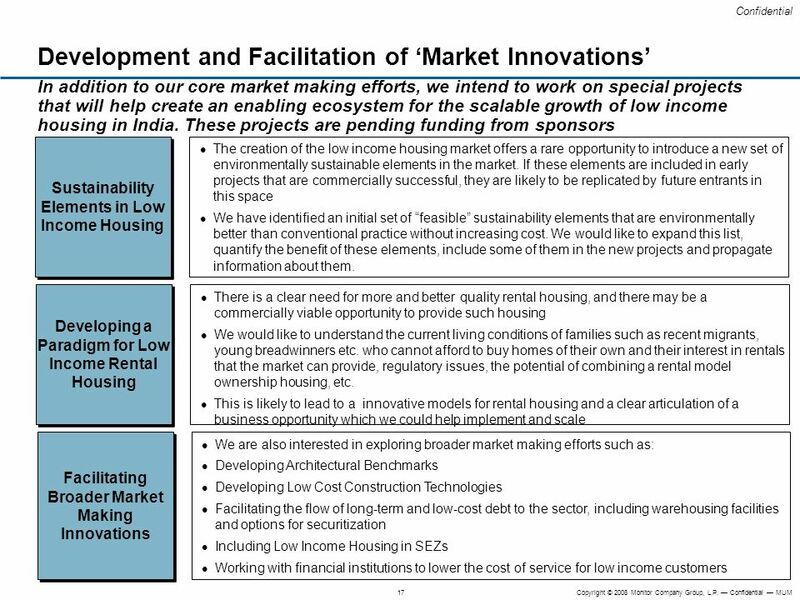 Facilitating Broader Market Innovations Sustainability Elements in Low Income Housing Developing Consumer Education Modules Developing a Paradigm for Low Income Rental Housing Monitoring, Evaluating, and Spreading Best Practices/Addressing Unintended Consequences Developing Architectural Benchmarks and Low Cost Construction Technologies Working with financial institutions to lower cost of service for low income customers Including low income housing in SEZs Facilitating the flow of long term low cost debt to the sector, including warehouse facilities and securitization options. 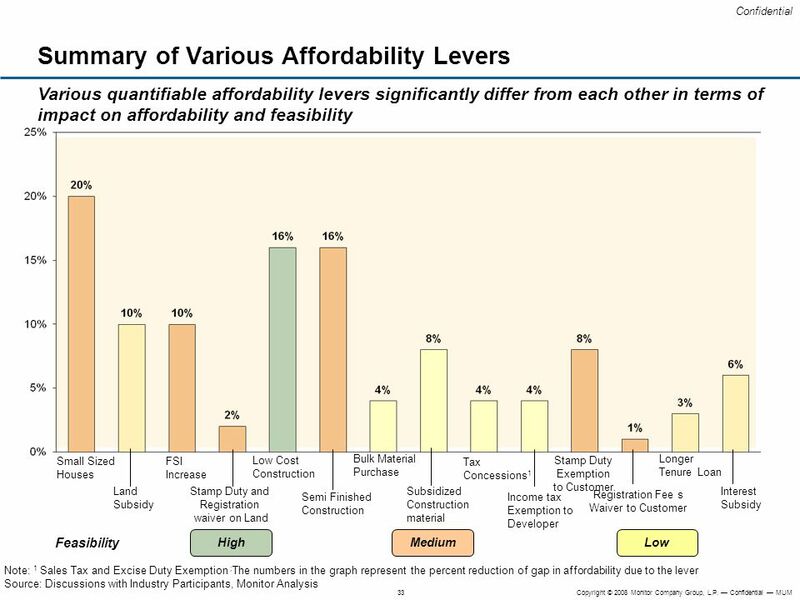 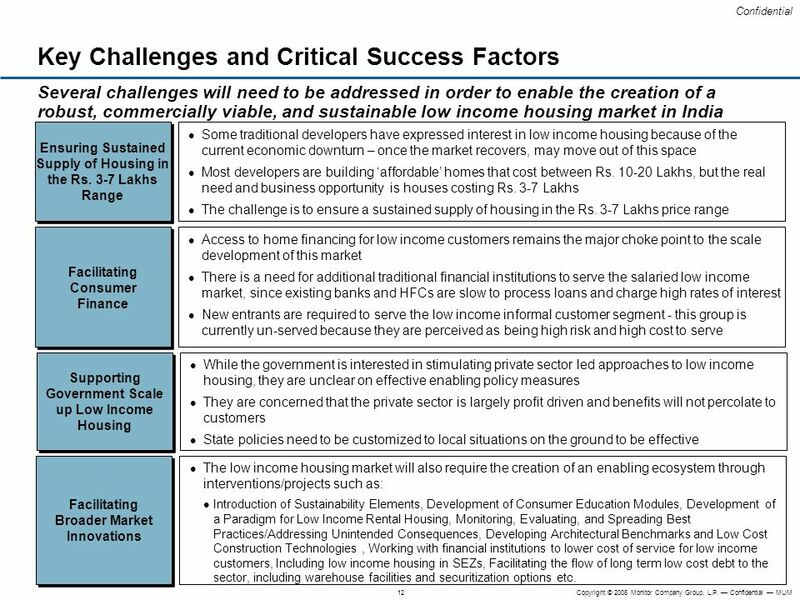 Several challenges will need to be addressed in order to enable the creation of a robust, commercially viable, and sustainable low income housing market in India Ensuring Sustained Supply of Housing in the Rs. 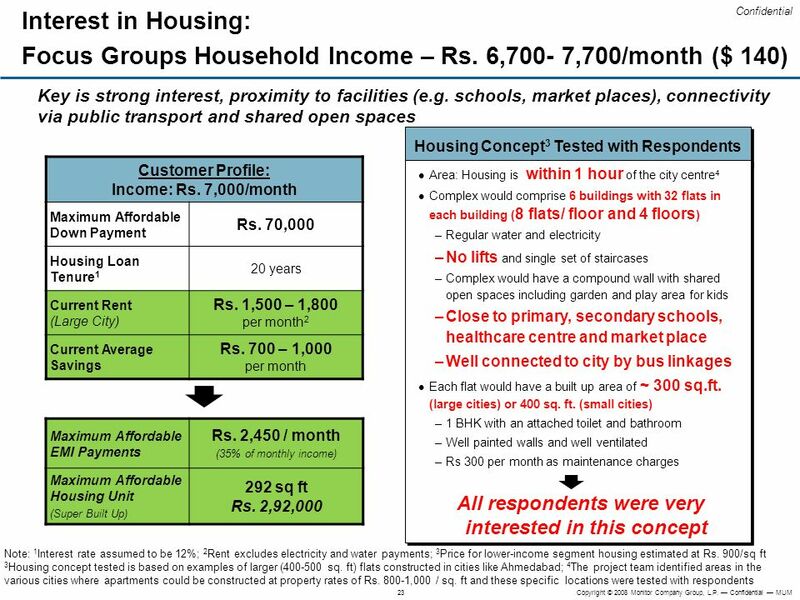 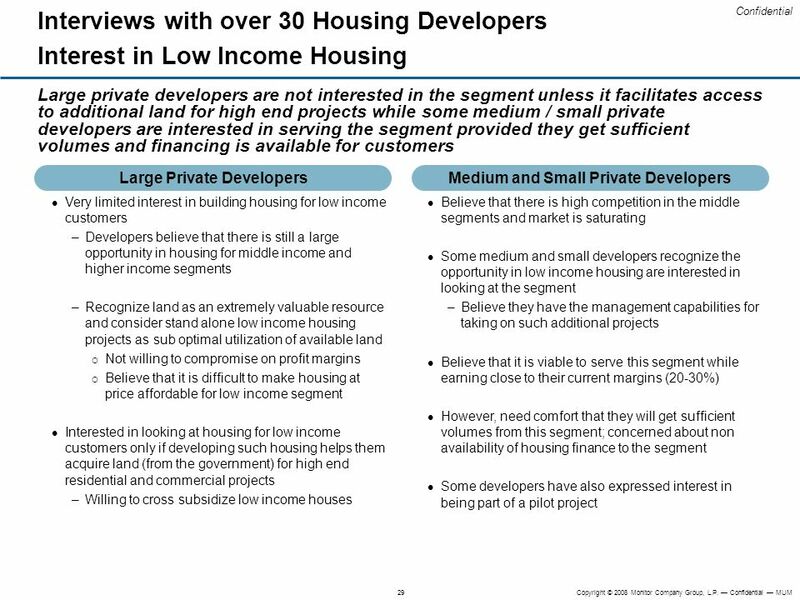 3-7 Lakhs Range Some traditional developers have expressed interest in low income housing because of the current economic downturn – once the market recovers, may move out of this space Most developers are building ‘affordable’ homes that cost between Rs Lakhs, but the real need and business opportunity is houses costing Rs. 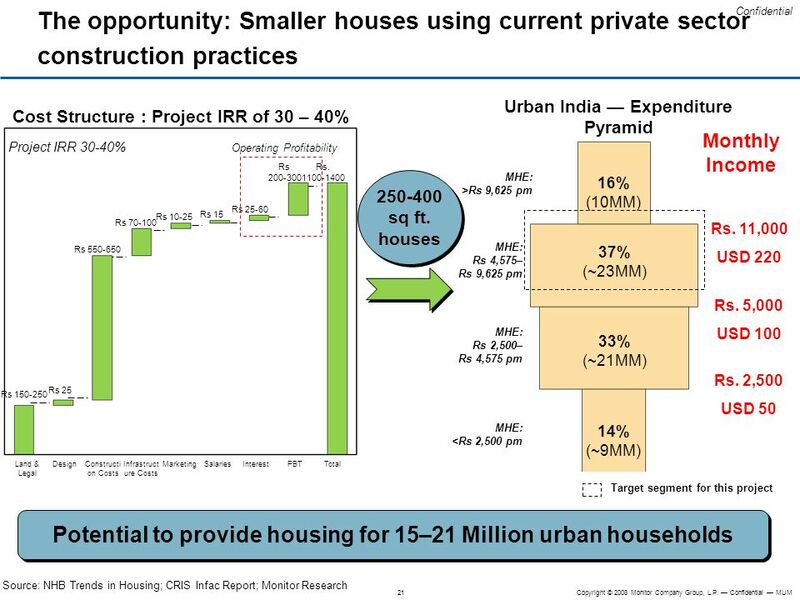 3-7 Lakhs The challenge is to ensure a sustained supply of housing in the Rs. 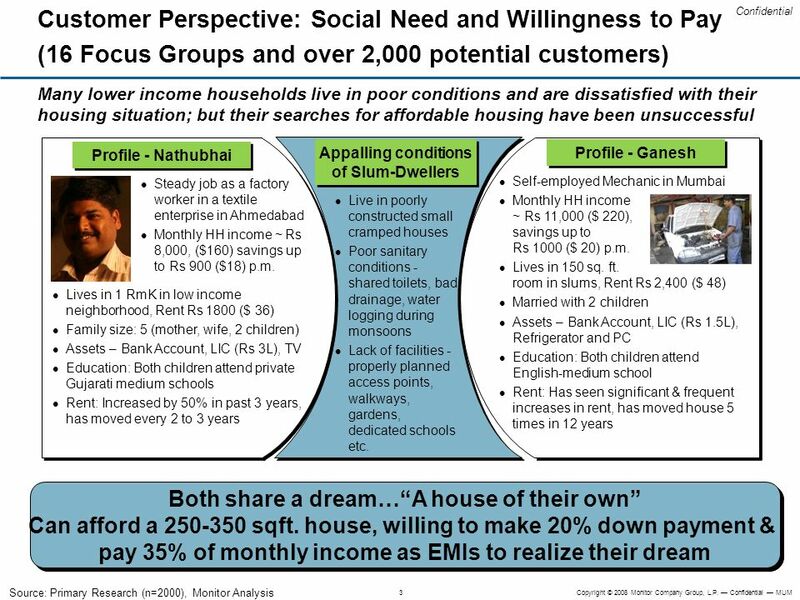 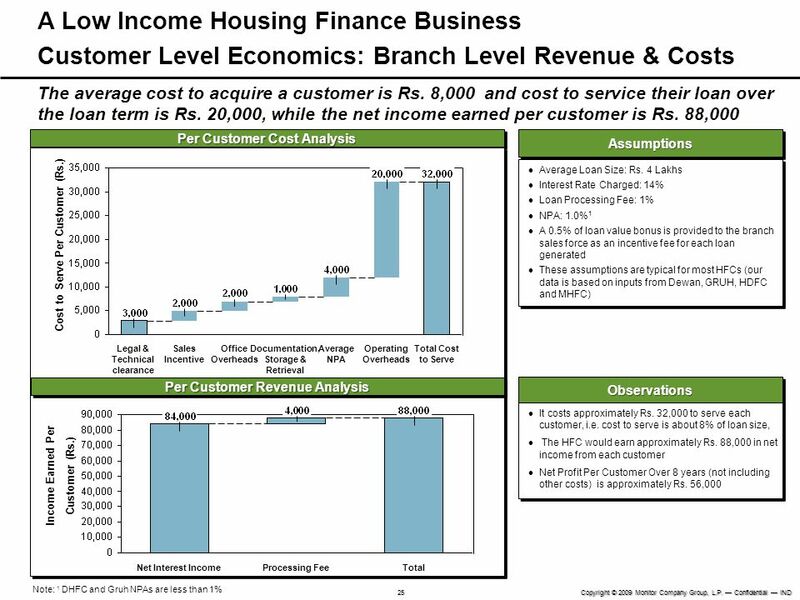 3-7 Lakhs price range Facilitating Consumer Finance Access to home financing for low income customers remains the major choke point to the scale development of this market There is a need for additional traditional financial institutions to serve the salaried low income market, since existing banks and HFCs are slow to process loans and charge high rates of interest New entrants are required to serve the low income informal customer segment - this group is currently un-served because they are perceived as being high risk and high cost to serve Supporting Government Scale up Low Income Housing While the government is interested in stimulating private sector led approaches to low income housing, they are unclear on effective enabling policy measures They are concerned that the private sector is largely profit driven and benefits will not percolate to customers State policies need to be customized to local situations on the ground to be effective Facilitating Broader Market Innovations The low income housing market will also require the creation of an enabling ecosystem through interventions/projects such as: Introduction of Sustainability Elements, Development of Consumer Education Modules, Development of a Paradigm for Low Income Rental Housing, Monitoring, Evaluating, and Spreading Best Practices/Addressing Unintended Consequences, Developing Architectural Benchmarks and Low Cost Construction Technologies , Working with financial institutions to lower cost of service for low income customers, Including low income housing in SEZs, Facilitating the flow of long term low cost debt to the sector, including warehouse facilities and securitization options etc. 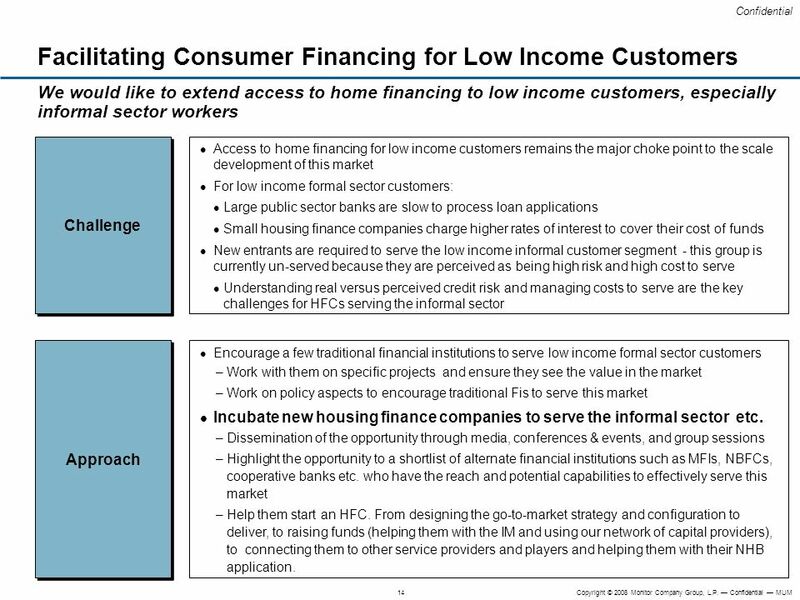 We would like to extend access to home financing to low income customers, especially informal sector workers Challenge Access to home financing for low income customers remains the major choke point to the scale development of this market For low income formal sector customers: Large public sector banks are slow to process loan applications Small housing finance companies charge higher rates of interest to cover their cost of funds New entrants are required to serve the low income informal customer segment - this group is currently un-served because they are perceived as being high risk and high cost to serve Understanding real versus perceived credit risk and managing costs to serve are the key challenges for HFCs serving the informal sector Approach Encourage a few traditional financial institutions to serve low income formal sector customers Work with them on specific projects and ensure they see the value in the market Work on policy aspects to encourage traditional Fis to serve this market Incubate new housing finance companies to serve the informal sector etc. 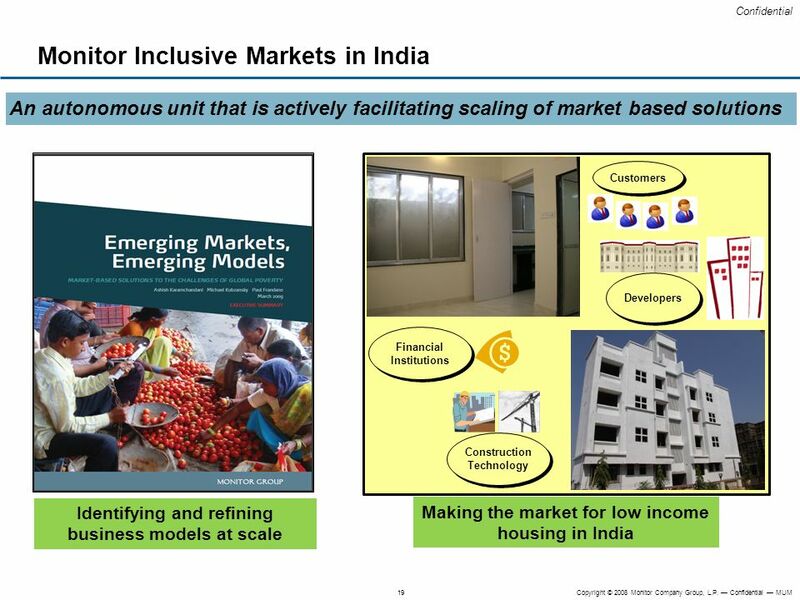 Dissemination of the opportunity through media, conferences & events, and group sessions Highlight the opportunity to a shortlist of alternate financial institutions such as MFIs, NBFCs, cooperative banks etc. 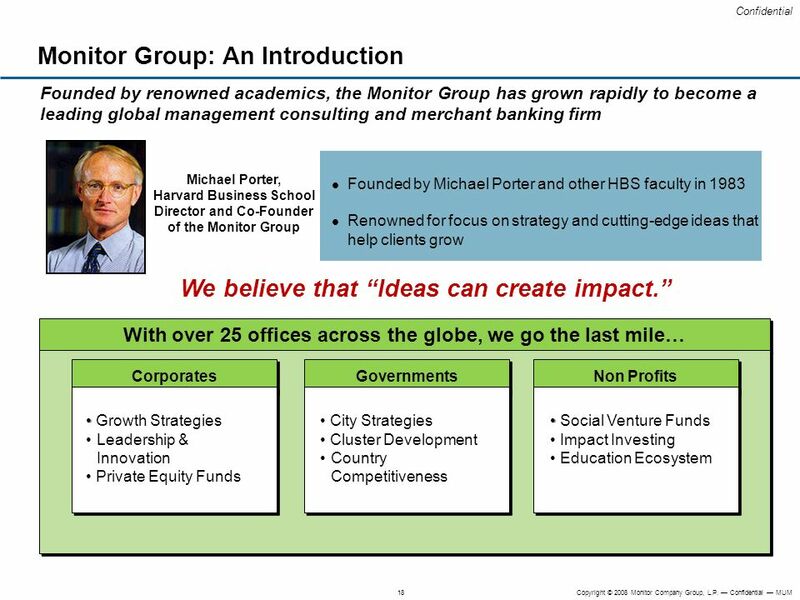 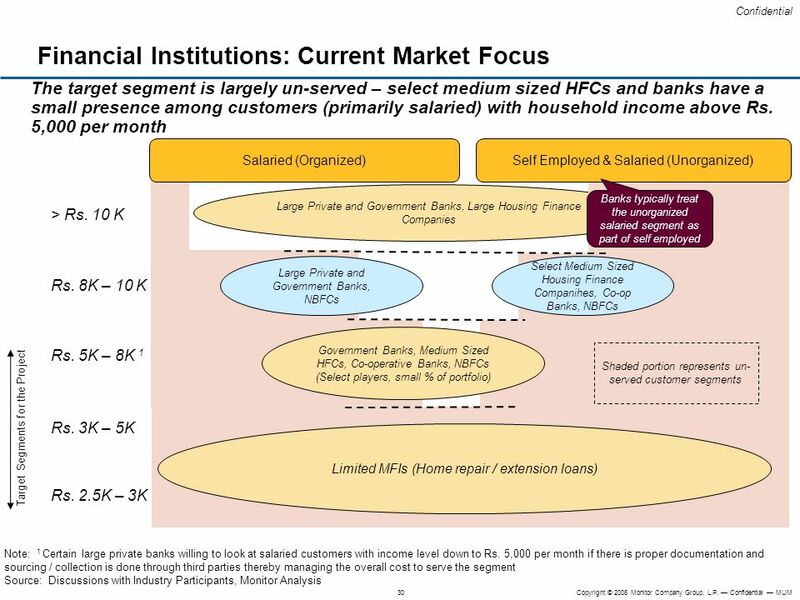 who have the reach and potential capabilities to effectively serve this market Help them start an HFC. 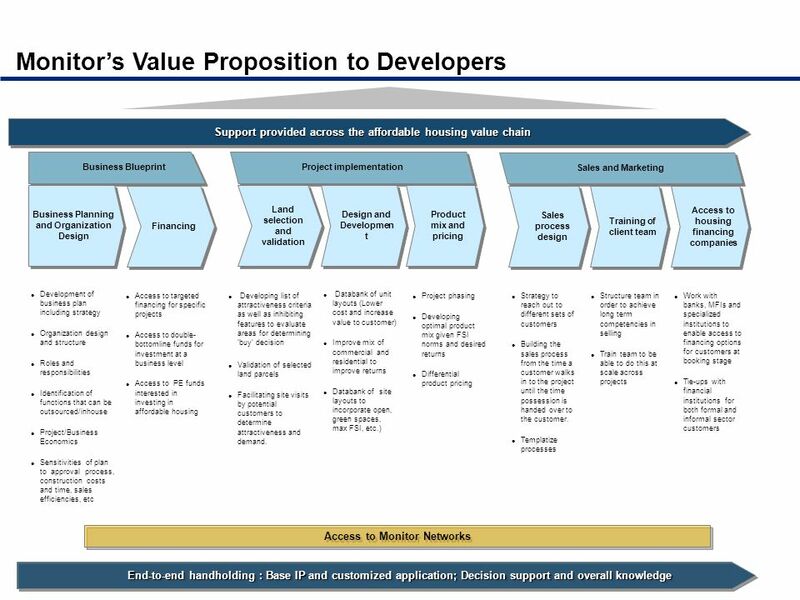 From designing the go-to-market strategy and configuration to deliver, to raising funds (helping them with the IM and using our network of capital providers), to connecting them to other service providers and players and helping them with their NHB application. 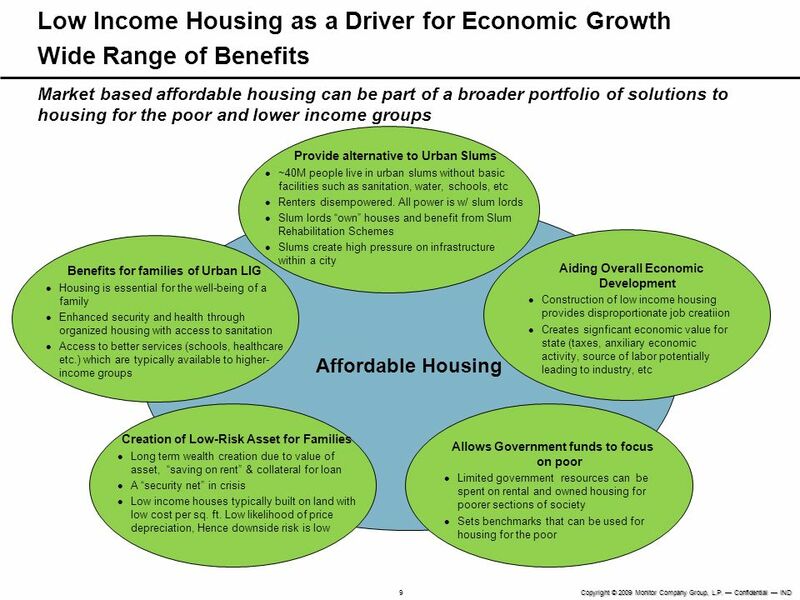 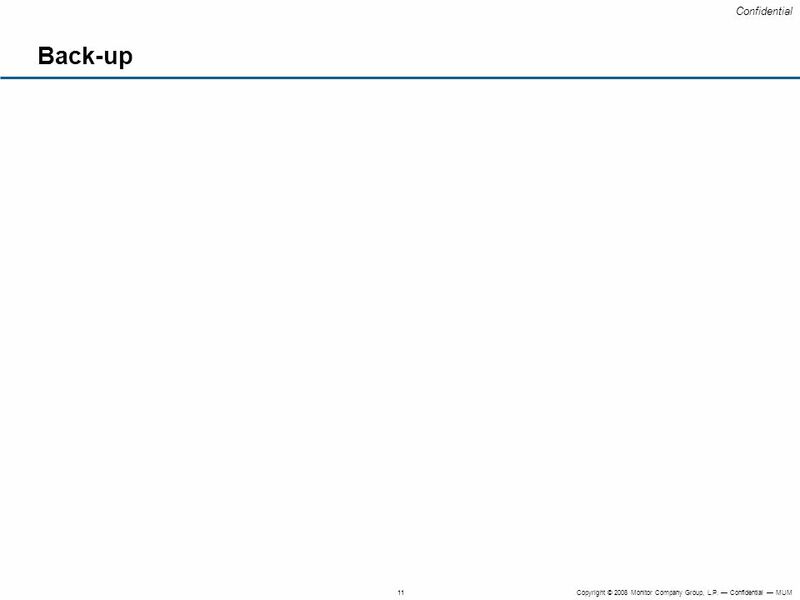 Download ppt "AMSTERDAM BEIJING CAMBRIDGE CHICAGO DELHI DUBAI FRANKFURT HONG KONG"
NHB-APUHF-APMCHUD International Conference on Housing: An Engine for Inclusive Growth Session IV: Housing Challenges: International Financial Institutions. 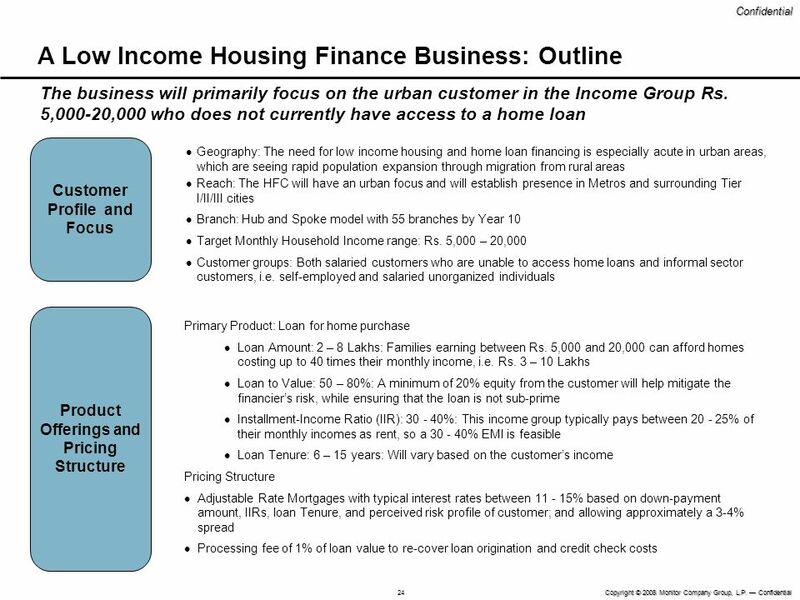 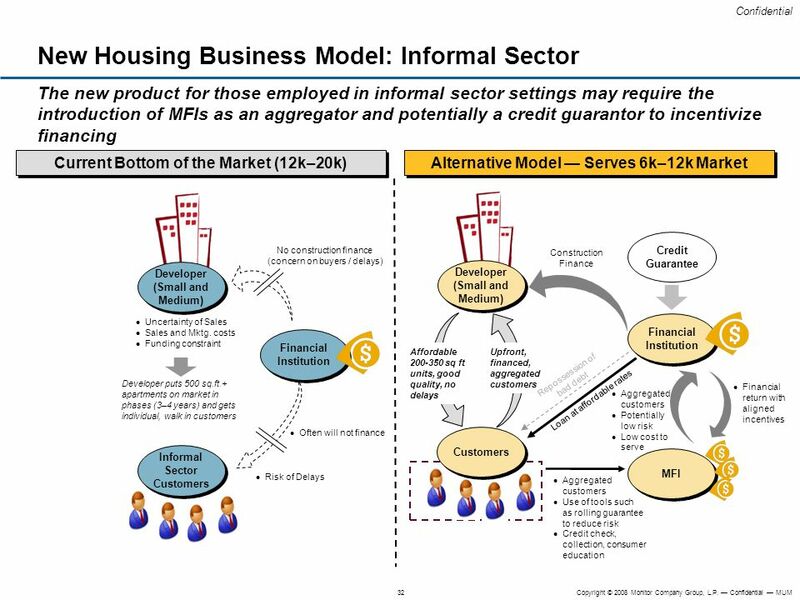 Micro Housing Finance Corporation National Housing Bank - Asia Pacific Union: Housing Finance January New Delhi. 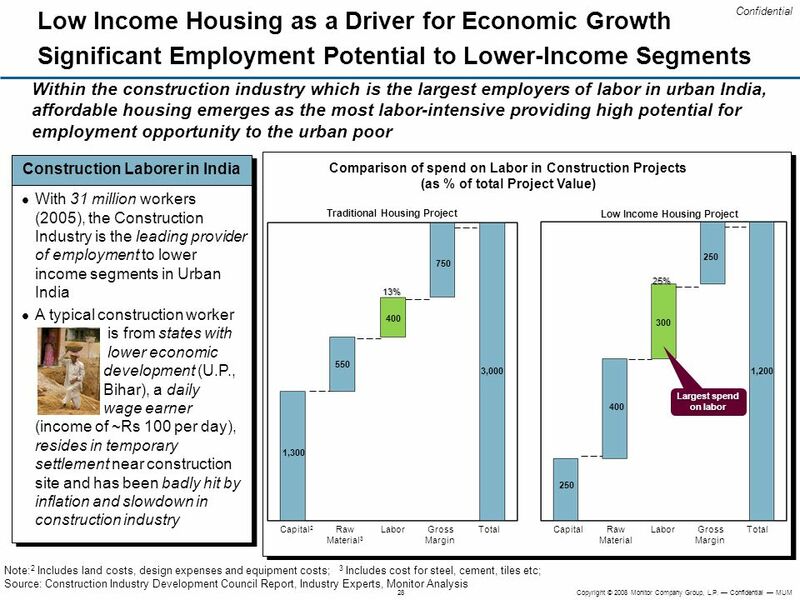 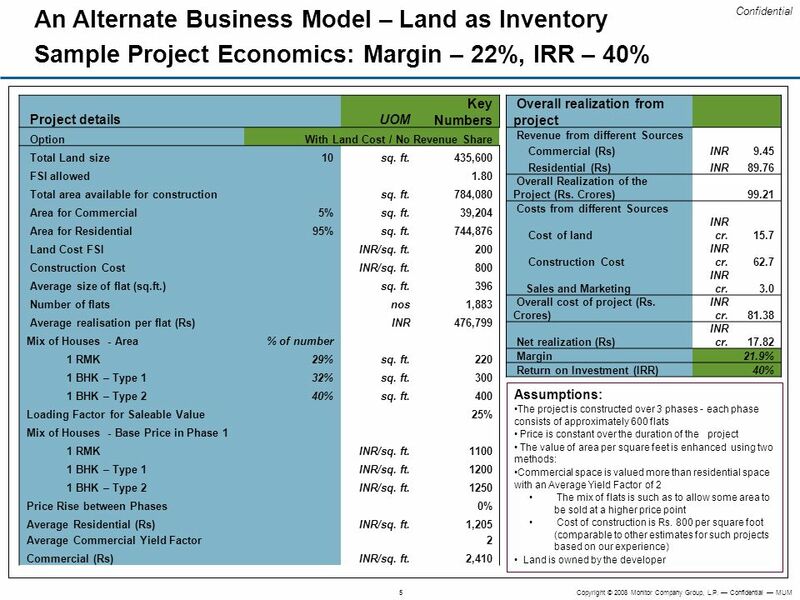 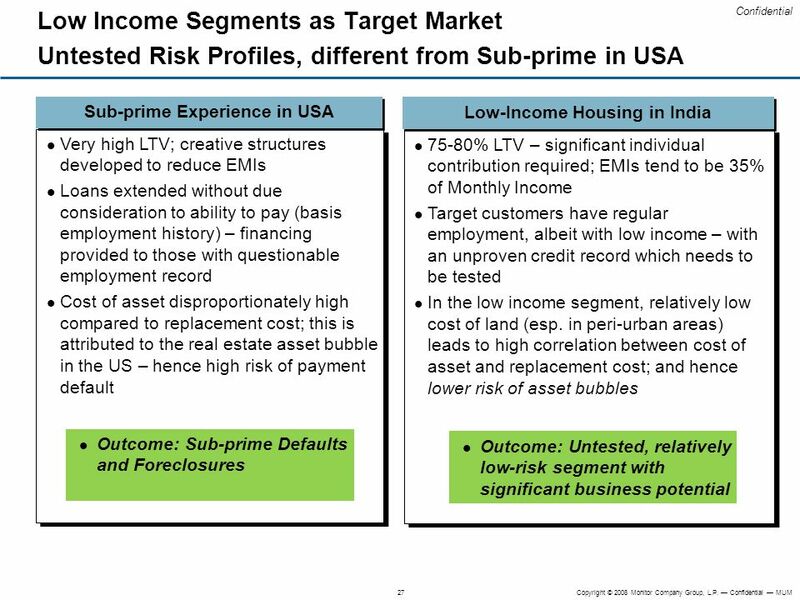 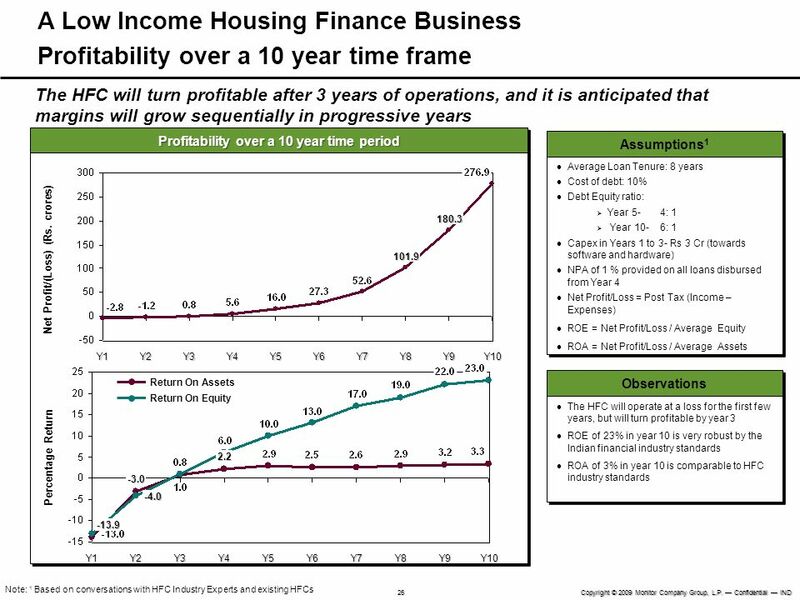 CONSTRUCTION FINANCE: LENDERS PERSPECTIVE Lower and Middle Income Segment. 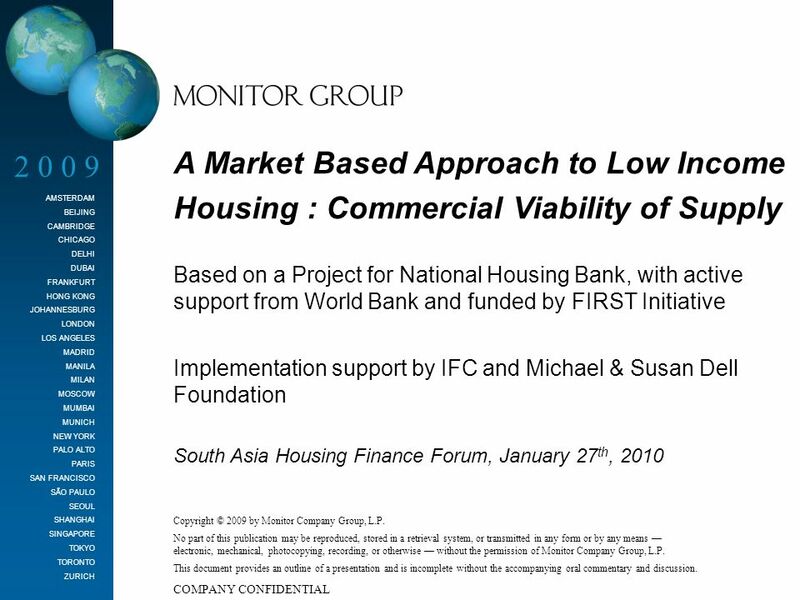 Islamic House Finance Mohammad Shaheed Khan Islamic Finance Division ABN AMRO BANK.